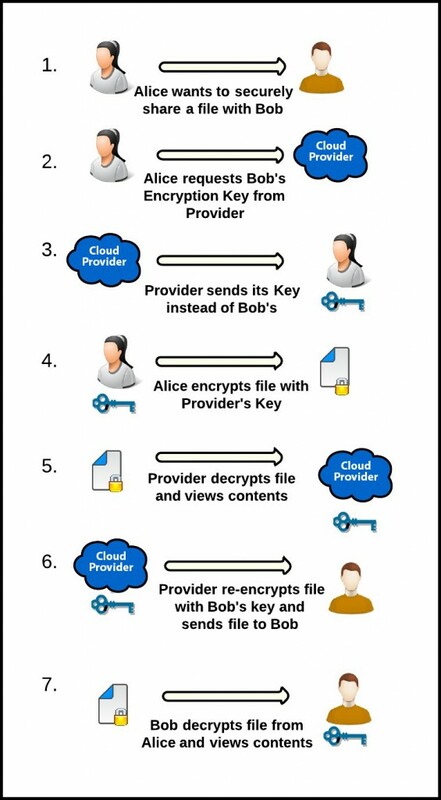 According to Johns Hopkins computer scientists, these steps depict the way secure cloud storage providers could secretly access the private files of their users. Graphic by Duane C. Wilson. The flaw is detailed in a technical paper posted online here: http://arxiv.org/pdf/1404.2697v1.pdf . The lead author is Duane C. Wilson, a doctoral student in the university’s Department of Computer Science in the Whiting School of Engineering. The senior author is his faculty adviser, Giuseppe Ateniese, an associate professor in the department. Both are affiliated with the Johns Hopkins University Information Security Institute. Their research focused on the secure cloud storage providers that are increasingly being used by businesses and others to house or back up sensitive information about intellectual property, finances, employees and customers. These storage providers claim to offer “zero-knowledge environments,” meaning that their employees cannot see or access the clients’ data. These storage businesses typically assert that this confidentiality is guaranteed because the information is encrypted before it is uploaded for cloud storage. The problem, Wilson said, is that privacy during file-sharing is normally preserved by the use of a trusted third party, a technological “middle-man” who verifies the identify of the users who wish to share files. When this authentication process is finished, this third party issues “keys” that can unscramble and later re-encode the data to restore its confidentiality. These storage services generally do not share the details of how their technology works, so Wilson and Ateniese substantiated the security flaw by using a combination of reverse engineering and network traffic analysis to study the type of communication that occurs between a secure cloud storage provider and its customers. The researchers pointed out that their study only focused on three storage providers that claimed their customers’ data would remain completely confidential. To solve the security flaw, the researchers recommend that the arrangements between customers and secure storage providers be revised so that an independent third party serves as the file-sharing “middle-man,” instead of the storage company itself. Graphic illustration available; contact Latarsha Gatlin.